DrumBeat: December 4, 2007 The Oil Drum How Big is your Bicycle? This past week Exxon Mobil announced the closure of their operating coal mine in Illinois, and their departure from the coal business. For those who worry most about greenhouse gas emissions this might seem to be a step forward, and, while I will likely write about that issue some other time, I would rather express a different concern today. Electric power is a fundamental part of our everyday life. Outside of the impact of the occasional storm, we expect that when we flip a light switch, the light will go on. Yet few give much thought to the power station that is generating that power. In recent years the new power stations that have been built have largely got their power from natural gas. But if the world oil is within that zone that we will, in future years, refer to as the peak plateau, the state of US Natural Gas is in a much more perilous position. The Barnett Shale is estimated to have a trillion cubic feet of natural gas every 7 square miles. The average gas in place in the Barnett Shale is 160 billion cubic feet of gas per square mile. The expanded play now has well over 2,000 successful commercial wells with very few disappointments and marginal wells, attributable to the low-risk, blanket nature of the productive formation. Driven by technological advances in fracturing techniques and horizontal drilling, natural gas production from the Barnett Shale has now reached levels exceeding 900m cubic feet per day. The wells initially produce for about 1m cubic feet of gas per day but experience a 50% decline in the first year. Then the wells stabilize and produce for an average 20 years, with expected life in excess of 30 years. Re-fracing a well after 5 years or so of production can add another three quarters of a billion cubic feet of gas to a well's overall production. . . In general, horizontal drilling has resulted in significant and material improvements in initial production rates over vertical wells (300-400%) with only a 40-50% increase in drilling costs. . . Ultimate expected recoveries have improved due to the flattening of the vertical well hyperbolic decline curve, to a much flatter exponential decline curve. Ultimate expected recoveries are anticipated to be in the range of 3-5 Bcf per well over the 30-40 year anticipated productive life, which should include initial fracture stimulation and at least one re-frac. Now you read that, you look at the number of wells that are producing and the thought does arise, that maybe we are being a bit pessimistic since, with all those wells producing at that rate over that amount of time, maybe the problem isn’t going to be upon us that quickly. Based on data from 187 Fayetteville wells provided by IHS and the Arkansas Oil and Gas Commission, I find little economic justification for the play at present. None of the vertical wells that I analyzed will recover drilling and operational costs. Only 3 of the 136 horizontal wells will be economic in the most-likely case, and only 13 in the optimistic case. Further, I cannot substantiate per-well reserves that approach the levels claimed by operators.
. Now in his subsequent column in the October edition of the magazine, he corrected some of the initial article, having been given access to proprietary information on well production. As a result he concluded that slick-water fracture stimulation can make a well profitable, some of his estimated charges were high, and the hyperbolic decline model does predict somewhat higher production and well life than he had originally assumed. There were a few readers who objected to using a four-year average well life in the economic model that I presented. One reader even suggested that I should have used 30-year well lives for the Fayetteville Shale. The longest production history in the Fayetteville play is 25 months and the average well has been producing for under seven months. I, therefore, investigated longer well histories from the Barnett Shale where 320 horizontal wells have been producing gas for at least two years (the longest production history is 68 months). The three longest-lived of these are currently producing at rates that are below lease operating costs. approximately 28% of Barnett Shale wells should realize revenues that meet or exceed drilling, completion and operating costs in the most likely case based on assumptions incorporated into a 10% net present value (NPV 10 ) economic model. Again, the article contains a fair amount of underlying data that provides useful information, including an estimate of $3 million for the drilling and completion costs of the wells. Currently he does not see the economics of the operation changing, nor does he anticipate any short-term changes in the market that will lead to an increase in gas prices. Yet I go back to his earlier article and the line “the three longest-lived of these are currently producing at rates that are below lease operating costs.” Those wells are around 5 years old. If, in fact their effective operational life is around 4 years or so, and they are typical of the wells in the field, then the longer term future of production has got to provide more concern that folks are currently exhibiting. That appears to be that we have no immediate problem and so . . . . .
Beginning to sound a bit familiar isn’t it. The current complacency over the longer term natural gas supply extends to the lack of viable replacement sources, and to what will need to be done to supply us, in the short-term, with the power that puts the light on, when I flip that switch. The other problem, of course, is that you don’t change power station fuel sources at the drop of a hat, and if, concurrently, we are hesitating to build the stations that we anticipate will be needed to match future growth, then the supply issue on the other side of that switch may give us concern sooner than we think. It almost makes you wish clean coal was economic which I doubt will ever happen. I believe the Brits have de-mothballed some coal fired generation now they have to import natural gas. I believe we should conserve NG for some higher priority uses than baseload generation or tar sands. These include CNG as a diesel substitute in truck fleets, nitrogen fertiliser, process heat (eg food industry) and peak power, preferably via combined cycle (gas and steam turbine). The trouble with the pricing system is that one size fits all..the market can't 'see' that NG is too valuable for 24/7 electrical generation. And one day we might get baseload from solar thermal or whatever. Sure as hell there will be a week long cold snap when we'll need that idle NG generator to cut in. I guess the next question is whether the EROI indicates that the Fayetteville shale is a good future resource or a likely example of receding horizons? I think EROI is really the major issue. Barnett shale gas seems to be non-economic at today's prices. Would it also be non-economic at higher prices? There seems to be a huge amount of shale gas available in other locations as well. We might produce it, if it makes economic sense to do so, but we can't otherwise. Another issue is the lack of long-term data. At this point, the whole operation is more like an experiment than a well planned out investment. We really don't know how much fracing will be required over a thirty year period, and what later years of production will look like. Even if we get the results from the first wells, we can't be sure that the situation is sufficiently similar from location to location (even within Barnett shale) that we can expect the same results elsewhere. I suspect the operators are all banking on much higher gas prices, pretty soon, and for the long term. Otherwise their behaviour doesn't make much sense. Does the economic model require them to keep developing and producing wells, even at a loss, to keep the machine ticking over while they await higher prices? My understanding is its fairly easy to shut-in gas wells and common since storage is limited. Gas in general is produced on a more as needed basis vs oil. But it makes more sense to wait. I'd have to guess a lot of these wells where drilled anticipating higher prices now not in the future. Its interesting how this < 5 year well lifetime has a big effect on profitability. At least for oil the economics seem to become marginal under 10 years. I think this may be a important limit. And one thats been overlooked. Thanks for the article. So its probably covered the cost of the well in one year and you make money. But lets say it produces 100 barrels a day. Then it takes say ten years to recover your costs if they are 3 million. If its say 1 million and the well lasts 5 years then your making a little bit of money. You can see how well lifetimes less then 5 years really changes the dynamics. In general your only making money the last few years. If cost increase say 50% your no longer making money. It seems to me that a lot of this production is fairly marginal. Are the producers counting on future price increases to give them profits? Seems more like poker than investment. "King Coal", the legend, is preparing to return, and reclaim his throne, after his long, un-fashionable, and "un-profitable", exile. Whether he's really cleaned-up his act, or not, is a moot point. King coal is still a finite resource and there is an increasing demand (read growing demand)for it. Sound familiar? So the King is quite likely just as naked as Emperor oil. I'm sure others on this site can fill in the technical details with the nice graphical analysis. Peak Coal anyone? 1) Gas companies only make money when they punch holes in the ground that produce. Meaning you have to drill holes! You can't make a living off of analysis alone. It's much easier to blog, arm-chair quarterback, or be an analyst. 2) A producing well (at almost any level) is a true fixed asset that I would much rather have than a fist-full of dollars when hyperinflation really takes hold. We simply will ALWAYS need more gas here in North America. I think the wise companies see this coming and are drilling like mad now while there is capital available. I have a stake in the Fayetteville Shale Play. First. The roads are taking a beating. are about to be used. "“The Department of Finance and Administration is studying very thoroughly how this industry and this product is taxed around the region, in other states,” DeCample said. The relationship between the state and gas companies is not broken down, DeCample indicated. The roads better stay in good shape. And the water better be taken care of as well. re: "The roads better stay in good shape. And the water better be taken care of as well." Why do you bother? Nobody ever comments on oildrum posts. People will start to care about this when they are paying $6+ a gallon at the pump and not a moment sooner. This past week Exxon Mobil announced the closure of their operating coal mine in Illinois, and their departure from the coal business. For those who worry most about greenhouse gas emissions this might seem to be a step forward, and, while I will likely write about that issue some other time, I would rather express a different concern today. The current complacency over the longer term natural gas supply extends to the lack of viable replacement sources, and to what will need to be done to supply us, in the short-term, with the power that puts the light on, when I flip that switch. Suggesting that we ought to build more coal fired plants in the short term without stating at the same time what you think our long term energy strategy should be encourages the tunnel vision which is typical of the response of our economic and political system to potential resource depletion problems. Clearly burning more coal in the short term is a stop gap measure and a highly dangerous one from the point of view of global warming. If burning coal is a stop gap, what to you foresee on the other side of the gap? These narrow focus technocratic postings about how to maintain business as usual functioning of the economy for another decade or so are useless. If you have a clearly defined energy strategy for the long term then present it, or at least post a link to a previous presentation. If you do not have a clearly defined long term energy strategy then the only sensible short term response to global warming and fossil fuel depletion is to advocate large reductions in energy use even if such reduction implies economic contraction. The goal of increasing the total volume of economic transactions forever in a finite world is insane. Our goal should be to produce a good quality of life with a minimum consumption of resources. Let growth occur in the intellectual and artistic realms and not in the magnificence of our personal dwellings and size of our piles of toys. Our economy needs to be structurally fixed and not merely propped up temporarily by technocratic energy policy. IMO the "growth religion" vs the needed steady-state economy is really the root of the peak-everything problem. We are not facing a peak-everything problem. There is not good reason to think there is a practical limit the the amount of fission energy we could develop. Or wind and solar. So you think we can "grow the economy" exponentially forever, on a round (finite) planet? Edit: to be clear about "exponentially": I mean X percent per year, which the economists seem to believe is "necessary". This leads to exponential growth. E.g., at a 3.5% per year growth rate, that's a doubling every 20 years. Quadrupling after 40 years, 8x after 80 years... For a great explanation of that and the consequences, see the lecture by Albert Bartlett - available on the web (e.g., Global Public Media) as video, audio, or text/figures. The most important math lesson you'll ever get. The problem is not simple and while there are several issues that can be addressed, we can divide it into the long-term, where sustainable sources will provide most of the energy needs and the short-term, where we have to provide alternate sources for existing infrastructure until we can get to the long-term answer. Picking (based on the Hirsch Report ) 20-years or so for this transition, and assuming that we are in that period now, I believe we are going to need all the "silver bb's" we can find to get through this period without major disruption. Picking (based on the Hirsch Report ) 20-years or so for this transition, and assuming that we are in that period now, I believe we are going to need all the "silver bb's" we can find to get through this period without major disruption. I agree about the “silver bb’s”, but the biggest bb of all is going to be reduced energy use and reduced economic activity in general, at least in the OECD nations. And no energy source whatsoever is going to allow indefinite exponentional expansion in the volume of economic transactions. The hope of no major disruptions in our current social institutions is a chimaera. If at the end of twenty years we hope to have sustainable, humane, democratic society, then fundamentally new economic institutions will have to be developed. Social engineering will be more vital than mere physical engineering. re: "sustainable sources will provide most of the energy needs"
How do you come up with the certainty that seems to be implied here? How can sustainable sources supply most needs - 1) without a massive conversion-to-renewables starting right this minute? 2) Even if this conversion takes place, can the needs be met? re: "I believe we are going to need all the "silver bb's" we can find to get through this period without major disruption." How is it possible that "this period" - of transition to "sustainable sources" can even occur at all? That's another way to ask the question. 1) You posit a future of "sustainable sources" - yes? 2) You posit a "alternate source" for "existing infrastructure" until...this "long-term answer". 3) But without having the plan, the means and the *actual work taking place* to make this huge move - how can it happen? In other words, I'm worried your silver BB will be just swallowed up, with nothing to show - a little ledge extended on to the cliff. Well I could just grin and tell you that at heart I am just an optimist, believing in the great inventiveness of society and the prognosis of the Hirsch Report, but actually I am a little more optimistic than that. There are some techniques that will provide some significant energy supply that are now at production scale and that will increase in size. Plus we are starting to see the investment in a broader search for answers than held true even a couple of years ago. Yes we really do need a plan that is much broader in scope than what we are seeing to date, and we need to be a little less confined by the current box when it comes to funding innovation and more flexible in what might be viable. But I know that there is work ongoing that will increase crop yields significantly, as an example. Twenty years may be a bit short, though my experience in other fields seems to show that as a first rough guess this is about how long it takes to get new ideas accepted at a significant scale. And there are some new ideas that may well give some contribution (though no silver bullet). One of my concerns is with institutional knowledge. Many of those that worked on potential solutions the last time are now retiring or retired. there has been little effort yet it seems to resurrect some of those ideas. And many of the working results came about after a lot of trials that didn't. So my bb may indeed get swallowed up, or quietly take the watch and head home to the rocking chair. There are however a number of colleges that are now creating Chairs in Energy, and if we could only find enough people to fill them we might have a bit of a ground swell starting. Well I could just grin and tell you that at heart I am just an optimist, believing in the great inventiveness of society and the prognosis of the Hirsch Report, but actually I am a little more optimistic than that. Governments will have to take the initiative on a timely basis. Without massive mitigation the problem will be pervasive and long lasting. Given the fact that in all probability peak oil has already arrived and no government initiated mega-projects or mega-changes addressing peak oil mitigation are in place (We are still selling SUVs, monster pickup trucks and 400hp sports cars for God's sake! ), a person claiming to believe in the Hirsch report might be expected to be a little bit pessimistic about avoiding major economic disruptions. I think that in general my posts tend a bit to the dark side, in regard to looking into the future. I have been quite pessimistic in regard to seeing any intelligent planning that has not been driven by political considerations (ethanol being a prime example). But I do see some change in that, not huge amount but enough to get me slightly more optimistic. I'm not sure that one "believes" in the Hirsch Report, rather it lays out a timeframe that indicates that if we don't start significant research we have a major problem, and I would suspect most of us agree with that. We could certainly grow the economy in ways that don't consume more of the few resources that are actually limited. Since our concept of growth is something of a fiction involving increased productivity in the production of goods and the delivery of services that don't really use much in the way of commodities to produce. The typical household could consume less oil, natural gas, coal and water (indeed much less) and still have an increased economic consumption in the form of more of the rest of the budget: better dental care, better schooling, better entertainment, etc. As currently measured, the economy would be growing. I honestly think the US could have grown through the 70's oil shocks except that the US economy was heavily dependent on auto manufacturing and the high gas prices made imports far more competitive. This partly explains why global growth did not stop in the 70's. Japan was growing like crazy and actually benefitting from the high gas prices. It's hard to tell what will happen this time around and of course it won't be over in ten years. But I just think it is very unlikely that global growth will simply stop. I think rather that there will be winners and losers with growth in some form continuing. Four new plug-in hybrids purchased and one Suburban that is driven off a cliff nets a lot of reduced oil consumption and yet allows the economy to "grow." No rational person would claim that all growth is bad. Obviously the rural populations of much of the developing world would like to have growth in a number of basic goods and services. And in the developed world growth in public transportation, renewable energy technology, sustainable agricultural practices, etc is highly desirable. The question is whether growth of the overall economy forever in every country and every region of the globe is a reasonable goal. The end of composite growth as the end all and be all of economic activity does not imply technological or intellectual stagnation. Our imaginations are imprisoned in the straight jacket of the market paradigm. The accomplishments of the Greek mathematicians and the great gothic artists and artisans of Europe were not achieved by the pursuit of favorable market transactions. There is more in heaven and earth than is dreamt of in your philosophy. The options are not either peak everything or exponential growth. The best outcome by me would be to stabilize the population and stablize/slow physical growth while growing virtual wealth (intellectual property, software, communications, entertainment, etc.) like now. Just wanting it to be does not make it so. As I said in my first comment, there does not seem to be a resource based reason why would could not grow fission, wind and solar for the foreseeable future. That is a different question than whether we would want to. Even if we can find substitutes for all finite resources. Even if we could manage to grow the economy endlessly. Is this really the sort of world we want? Not me. Obviously humans havbe to fulfill basic caloric needs and perhaps have some form of shelter and clothing but beyond that basic survival people can be "relatively" happy in comparison ot others or to what they do not know about. PErhaps a culture of who can do with less or conserve more as a competitive downsizing/powerdown could come into being. Thiose who could find the cheapest form ofentertainment, for example a guy like Homer with his great memory could provide entertainment and whoever had the best dreams everyday and told them could win applause from the group and be "leader for the day". Materialism is a dead letter. Watching on TV how a chimp outsmarts a university student starts you thinking perhaps we aren't as smart as we think and should focus on increasing our gray matter and be more content about exteranl things as I don'T see any objective evoltuionary improvement in humnas since they invented agriculture much less industrialization so who are we fooling? There are other factores at play. There was a huge increase in rig utilization and holes drilled since the last low about 2002, but I read somewhere recently that there is now no spare drilling capacity. USA production declined about 5% from 2003 through 2005, and that big increase in drilling (near 100% if memory serves) just offset declines in producing wells and recovered production in 2007 to the 2003 levels. If we can no longer make significant increases in wells drilled, we will be back to a net decline. Canada cut back E&D investment sharply in 2006 and their production is expected to be down in 2008, while tarsand demand is increasing. There is no sign of major increases in LNG imports, and it already looks like a cold winter in Europe and Russia. With Japan LNG demand up, due to their #1 nuke plant being down, competition for LNG is likely to be high. My estimate is that by spring 2009 we are likely to have an NG crisis. This was a really decent article. For whatever reason, I haven't been dropping whatever I'm doing to read articles by Heading Out, but this may change now. As noted in the article, because of its use in electricity generation, natural gas is a compelling topic. For those of us who heat our homes with natural gas, it is quite a bit more compelling. Although long-term readers will tell you that I do occasionally venture into "troubled waters", the thought is appreciated. Nice and comprehensive, doomerish(reading last two pagees is hair raising) Reading to anybody uninitiated, 41 pages of horror. Good summary using all the graphs and stuff from Stuart, Graphoilogy(Khebab and WT), etc. My report is optimistic in putting the collapse some decades away. It could happen tomorrow, with some unforeseen problems occurring simultaneously, like: (1) the Strait of Hormuz problem, (2) an attack on oil refineries in KSA.....hmmm just read in The Wall Street Journal that KSA rounded up 200 rebels...kinda makes ya wonder what those boys were up to......(3) and the power grid failure problem (could happen from coincidences, like in 2003) What is the first law of policy analysis? "If something can go wrong it will." It's winter now, this could freeze half the U.S. population. Imagine, most of the East coast, Midwest, and Canada depopulated in a month. Everyday I look at the news and hope I don't see bad signs. I won't relocated myself until late January, and it is really a cold winter here in New Hampshire. I'm not paranoid, I've just been teaching risk management for 30 years. Why won't dynamic pricing prevent rolling blackouts? The trend in the electric power industry is definitely in the direction of dynamic pricing. Rolling blackouts seem totally avoidable as long as prices can rise to make demand and supply to balance. I'm looking for world oil supply and demand data since the 70's to today, but am not having any luck. would any of you have any perchance? I'm looking for either the supply/demand raw data, a graph, or a link to anyone of this. again, oil supply and demand data as far back as possible, preferably in the 70's, but i'll settle for the 80's. I found some change in the couch. Give me a cubic mile of oil. What's that? You won't? Well, screw it then. You can follow oil supply in BP's big Excel file. I'm not sure how they would go about showing demand as a thing distinct from supply, but even if they could, there was a 26-billion-barrel spike in demand late in 2007 that won't have shown up yet. may be what i need instead of oil production is excess oil production capcity and show how the gap between excess capacity and consumption has shrunk! I'm not sure exactly what supply/demand graph this would be though, since in a free market essentially supply = demand, with the price being adjusted. since the total worlds storage capacity is about 14 days production (working from memory, the number was mentioned a while back here somewhere), and the amount actually in storage doesn't change by a whole lot then i think that you can read any oil demand smoothed over a 1 month (or longer) period as the supply at a specific price - one of the reasons oil price is so spiky is this lack of storage capacity, and the short term in-elasticity of demand. Also, look at the references in this report, esp the German Energy Policy report, Hirsch, GAO, CBO study and the Robelius study. Try the ASPO newsletters at http://www.peakoil.net/ click on Newsletter at the top right , try googling "peak oil" powerpoint, or whatever you are looking for and powerpoint. Good luck, and don't get discouraged. Unscrewing the inscrutable is hard to do. I'm amazed at how even scientific people deny reality and go off on tangents, like beaming sunlight from outer space is going to save us. How the fork do you counter such baloney. HO - thanks for this article. Gas supply is a crucially important subject that has received altogether too little attention, even in PO circles. Question to the group: Does anybody have data on the EROI of the gas business, either historical or current? I haven't seen much along those lines and I'd like to understand it better. For those who track these things, the article that Leanan captured on production in Wyoming also contained information on well costs, at between $2.5 and $4 million for horizontal wells up to 10,000 ft long and with slick water fracing. OK, but HOW FAR underwater (economically speaking) are they? Your article doesn't say. If they're only $5 a year unprofitable, so what? I'll look under my couch for some change and fix that problem. If they are off by 50% or some order of magnitude, then you have either a big problem or a catastrophe. Scale matters. Nor do you state at what extraction rate/price ratio they become profitable. As a consequence, articles like this tell me "Hi! let me blow some smoke at you". I don't disagree with the general issue "gas is in big trouble", but if you're going to say "they're not making money" and "that's a problem" then kindly scope the problem for us. All this tells me is "Gas is going to go up in price, maybe a little soon, maybe a lot later.". That's not a big surprise. My point was on well life, rather than economics, and it is true that this will depend on price. But I doubt that anyone is going to continue to pay more than their return for very long (and with these levels of numbers we are not talking about $5 increments here) even if the differences were "relatively" small. It's interesting to see what the Barnett Shale gas play has done to Texas natural gas production--it's basically just flattened, at least for a while, the decline curve. Check out pg 23 for Initial Decline Rate on different kinds of gas wells. They model well production behavior by linking together linear segments. So initial decline for X months, then second decline rate for X more months, etc. The non-conventional wells seem to decline twice as fast as the conventional. And the supposedly "stable long term" decline rates are as fast as the conventional wells initial rates. I wish we could get data like this on US wells. I noticed something interesting on the Texas data set. Until last year, the last time we produced 6 TCF per year was 1982, from 42,000 wells. We were able to get back over 6 TCF in 2006, but it took 83,000 wells to do it. In other words we doubled the number of wells in order to basically maintain flat production. Note that the Texas peak was over 9 TCF per year in 1972. I have a general question about natural gas figures. What about natural gas ? Are those "proven reserves" verified by unbiased organizations and is it safe to say that there won't be a global peak in gas supplies before 2025-2030 ? "In other words we doubled the number of wells in order to basically maintain flat production." HeadingOut, a question for you: US reserves of coal are much greater than Canada, but do they have more unrecoverable coal than the US? Meaning, do they have more coal bed methane? The Canadian Natural Resources Board is projecting that Canada will make up for falling conventional NG by drilling coal bed methane wells. But the US has already peaked in coal bed methane production and at lower levels than the Canadians hope to reach. You don't just get coal bed methane (CBM) from unrecoverable coal seams. Methane can be a major problem in mines that are productive, since, in seeping out of the coal it can generate an explosive atmosphere. Thus mines will try draining the seam ahead of production in some instances. There are a number of problems that exist in extracting CBM in different places, and some are technical and some financial, so I am not sure that I would be that confident that we have seen a peak. To a degree price controls whether a given volume is a resource or a reserve, and prices will go up. If you skim it you see they will have to drill deeper and need a higher price to afford it and that USA is importing more LNG so prices are cheaper and it takes more time to drill and regulatory and tax problems are making it hard and the ELM factor is hitting as Canadians are using more themselves and producing less. Here is a Bloomberg article which reports NG shipments from Canada to the US may decline as much as 15% by 2009. Here's is a video interview with geologist David Hughes of Canada, which is well worth watching, bc he talks about "peak coal" which, along with NG, is so critical to our production of electricity. As noted in my earlier post, US coal production peaked in 1998. Why? Two reasons - 1) steady declines in the Appalachian region as this is a very old mining area, with higher and higher production costs and depletion, and much of its coal is high in sulphur and therefore exceeds US Clean Air Act limits, and 2) the chockerblock transport system out of the Powder River Basin, which has reached its limits. The Powder River Basin could potentially increase production if the transportation roadblocks are eliminated - this remains to be seen. In the meantime imports from Columbia are continuing to grow.There are two basic types of coal - coal that is suited for thermal power generation and coal that is suited for metallurgical uses. The US exports metallurgical coal and still does - this is a bread and butter issue for many producers. Importing thermal coal from Columbia, which is now up to 30 million metric tonnes per year from zero in 2002, which is required to supplant deficits in thermal coal supply for power generation. Metallurgical coal exports, which are generally much higher in price/ton than thermal coal, have continued as the US steel industry has contracted radically and the demand is not there domesically for this type of coal. Despite being accused of stating that the US is a "net importer" in a previous post I said nothing of the kind - only that after a couple of centuries of satisfying all its needs domestically, the US became an importer of thermal coal in 2003 and these imports have been growing year-after-year. Onshore Texas and Louisiana overlie an enormous volume of geopressured brine reservoirs. In addition to assorted nasty dissolved solids, these brines are saturated with methane. The depth, size, etc of these reservoirs was very-well mapped because, if you were drilling for oil or dry gas, you really, really, really wanted to avoid this stuff. 30 years ago, conservative estimates of the amount of methane were sufficient to cover the entire US energy demand (not just NG demand) for 200 years. I was involved in academic systems analysis of the problem. Producing the methane wasn't difficult: the flow rates from simple vertical wells were enormous, and any sort of simple pressure reduction allowed the methane to come out of solution. But what to do with several billion barrels of toxic/corrosive brine each year? If you reduced the pressure through, say, a turbine, the analysis suggested you could recover enough energy from the heat/pressure of the brine to pump the stuff back into some sort geologic structure at about the same depth as the reservoir. But hot brine does really nasty things to turbines. TTBOMK, no one has figured out a practical way to produce these enormous domestic methane reserves. David Hughes' statement about peak coal is key to understanding the problem. I went to the EIA numbers and worked it out - As we produce more sub-bituminous and less bituminous coal, the actual energy content of our total production goes down, even as we extract more tonnage. Combine that with Jean Laherrere's 23-year discovery to production parallel. 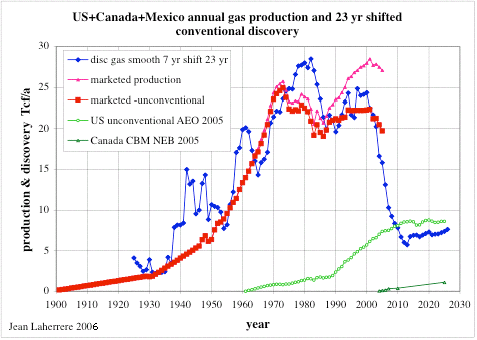 He produced a graph (On TOD Europe: http://www.theoildrum.com/uploads/510/LaherrereGas04.png) showing that conventional NG production in North America roughly but consistently lags discovery, TCF to TCF, by 23 years. It's a great predictive tool that shows NG production dropping off a cliff in the next five years. Conventional NG discoveries dropped by about 75% in the early 1980's. It makes sense: If they didn't discover it and start to develop it, they can't pump it now. The unconventional sources look as if they will restrict the drop to *only* 50%. great graphic. Sort of like telling a cancer patinet they have 6 months to live. We can create methane by gasifying biomass. This would be CO2 neutral, renewable and keep the U.S. from developing costly LNG terminals.